Experienced altcoin developers agree that the most stressful, troublesome and time consuming part of creating a profitable altcoin is the hiring of the required personnel. Not only is it difficult to find “the right people,” but it also becomes a creative tug of war and quite frankly a nightmare to manage each of these individuals at the same time, which often leads to tasks not being completed, deadlines not being met and, in worst case scenarios, this in-fighting often leads to the demise of entire projects. What if developers could skip this process entirely and still end up with a high quality, premium currency to list on a high volume exchange where they can convert their premine supply into hundreds of Bitcoins? Well, the KoinKartel allows you to skip several months of development time because we have already done the work for you. All of our currencies come as part of a ‘complete,’ readymade package. So there is no need for you to waste several weeks trying to come up with a concept, name or a promotional campaign – we have already done it for you, saving you months in planning, research and development time. 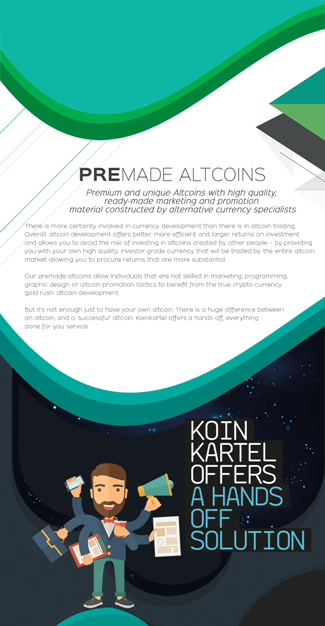 KoinKartel allows you to eliminate middlemen developers such as; programmers, graphic designers and marketing personnel yet still end up with your own, high quality, premium altcoin to list on the exchanges. The premade aspect of our altcoins and marketing materials completely eliminates the need for you to waste several weeks attempting to formulate a promotion strategy, we have already done the work for you. Our currencies are custom built from scratch, so: no more clone coins. Each of our altcoins have their own unique set of attributes. Supply management services are provided to turn your altcoin into an asset not only for yourself, but for the exchange it’s listed on. Premium branding, and concept implementation come prepackaged and ready to go, no need to hire a platoon of designers and coders. Promotion is all in the branding. Each of our altcoins come complete with premium, high quality branding to set the market on fire. unique currencies with high quality, full suite branding packages. end up with a supreme quality altcoin to list on respected exchanges. I have never developed a currency before, is this a problem? already done the work for you. Can I sample your work before purchasing? both parties, therefore all funds destroyed and forfeited. How do I manage my altcoin after purchasing? altcoins supply into numerous bitcoins. How does exchange placement work? assets not only for the dev, but for investors and the exchanges. Do you offer presale management? direct a complete presale campaign.